Somehow you got locked out of your car. It is very inconvenient and may be annoying but look on the bright side, this happens to people all the time! 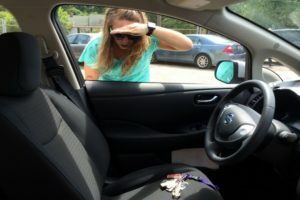 Some of the common reasons why people get locked out of their cars include: A broken lock that would not work; A broken key that just would not fit into the lock; Lost car keys; and the most common one, your car key somehow got locked in the car. Regardless of the reason, the major concern is to be able to enter your car and drive it and the solution is to get a professional locksmith that can reach you wherever you are and help you regain access to your car. Keep your keys on you. This may seem like a huge task but the simple way out is to always have them on you whenever you go out. So, when you park your car at your place of work or In front of the grocery store, take your keys with you. Whenever you leave your key in the ignition or the keyhole, it might as well be an open invitation for someone to drive away with your car. Therefore, whenever you are away from home, always keep your keys on you. Make a spare key. This option is most suited for people that lock their keys inside their cars often. The spare key can be made by your trusted locksmith and you should keep it in your wallet or on any other thing you always have on you. This will ensure that you can use it to unlock your car and get in. Fix the faulty lock. For people with cars that have broken locks or damaged keys, you should fix the lock and replace the key as soon as you discover the problem. This will prevent a situation where you have to put your locksmith on speed dial just so you can get into your car whenever you lock it. The other option would be to never lock your car but this is unadvisable for security reasons. Broken keys should be replaced. Although most keys rarely break, with rough handling or forceful use, it is possible that your key gets broken inside the lock. You will need to call the locksmith to help you extract the key and also cut a new one. Be attentive. For new car owners, it may take some time to get used to the idea that you need to be conscious of where your car keys are. Therefore, it is advisable to get weighted key rings so that when you do not feel the weight in your hand or your pocket, you will know that your key is not with you. Alternatively, you could get a key ring with noisy attachments so you can hear or notice when your key falls or when it is not with you.